Looking for ways to make my house look less like a dull council house. I'm on a corner plot with a mismatched extension. Very small windows. Large drive which is about 3ft above the height of the path down to the front door. 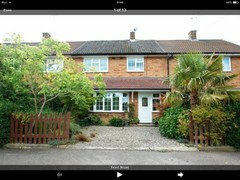 Got about £2500 which needs to include the front door and double-glazing and would love your thoughts/ideas! Remove the Xmas lights. Add some brick / wood around the door , like a open porch with a tiled roof add some creepers and a flowerbed border near the front. Pillars overkill but open sided with wood and brick wall sides but not fully. Bit like this pic. Also extend the width and maybe have free space to the right so at least the Porch roof is centre of the house. I agree with the comments above - a bit of greenery outside will liven up the whole exterior. Why not stack some decorative logs and wrap some lights around them - might be nice! That or get some tree stumps and storm lanterns (just figure out how to keep them from getting stolen!). I'd remove a few layers of the brick drive in front of the house to make these flower beds for shrubbery. A porch would look good but only if in keeping with the house style. 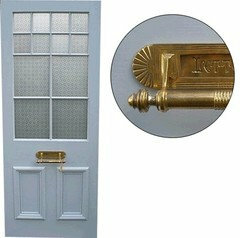 Anything too ornate is going to stand out like a sore thumb. Thanks for the comments. I need a new front door and windows so open to colour/style suggestions. The front window is very small so I have thought about making that bigger but conscious of my budget. Love the porch idea but the front door is approx 3ft below the height of the drive (pic is deceiving) so the side wall would be impossible. Under the window needs to act as a soak away because the water runs off the road straight down the drive and sits in front of the front door! The pots etc would look nice on there though-nice idea thanks. Thanks alant1000 I could put steps down from the drive-would have to keep fingers crossed that the drive didn't collapse though! ( that's the plant not style) to be placed so you can have a nice scent as you come home. The door looks like a sad face. Change for a real wood door and paint a cheery colour. Plants either side of the door! Really like the grey! Windows to match or stick with white? Ann I could have a canopy and enter from the side no problem. Does anyone know of an app where I could try different doors/windows on the photo to get an idea of what it would look like? try not to fight with the look of the other side of the semi or you could end up devaluing both houses. When you replace the windows copy your neighbours configuragtion. As far as the short window I think it will offend your eye more if it doesn't match your neighbour. 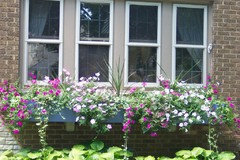 Consider a window box to trick the eye into thinking your window is longer.....site it a little lower than usual so that the plants are covering the brick rather than the bottom panes of glass. I tend to agree with the previous comments. Get rid of that sad door! 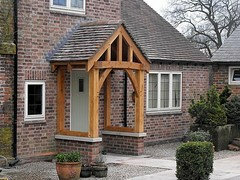 You can create a frontage to give kerbside appeal that will not devalue your neighbours and appear warm and homely and inviting. Consider your curtains or roman blinds, and window boxes which do not dominate, but enhance each window. Consider a climbing plant to add a feature to that large expanse of brickwork and the waste pipes (redirect them inside), something that suits the aspect, and you will see the difference and encourage the neighbours. Good luck and be patient, and ideas for the rest will come! agree with all statements above. it is difficult, when you have a certain budget. i guess do what's most important to fix first, then work your way. and actually, how much do you want to spend on your house in total, whether this is just a temporary one or forever home. 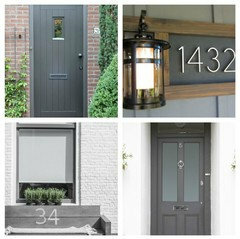 if you can find a good price on a composite door(though wood is always nicer and better for environment ;) but the composites are strong and you never have to paint, they come in many different styles and colors. grey, green, wood-like. windows... well, i think if you can afford cream ones, try them. they will REALLY make a difference. i know other colors can get more expensive. 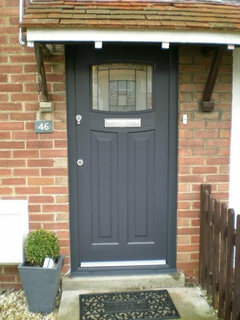 New front door defo, plus a couple of deep beds either side of the door (1 metre deep at least) and extend the step out from the front door by the same amount. The beds wil help deal with the rain run-off from the drive. With such a small budget you are wise not to rush into any decision just yet. 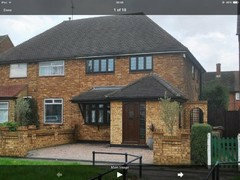 It is also important to consider the neighbouring property when it comes to how you handle any architectural changes.As you say the extension has been poorly thought out and I suspect those two small windows are in fact part of a downstairs wc and other small room? in which case removing them and replacing with one to match the other living room window would be a problem.But if you could remove all three downstairs windows and replace with two larger in a similar style plus replace the front door plus a more decorative porch, it would instantly make the front of the house more attractive. Include the suggestions above for a couple of attractive potted topiary either side of the front door and in the summer hanging baskets will give instant colour to up the kerb appeal. After that you can concentrate on suitable landscaping for the drive. 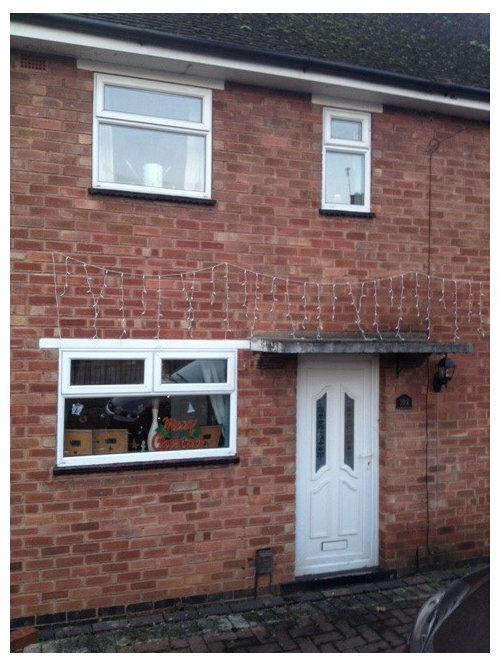 You do need to remove the xmas lights. 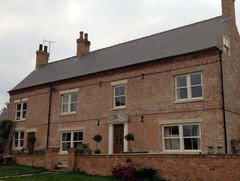 Casement style windows with lead will improve, and provide more of a cottage look. 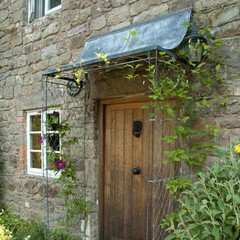 A canopy with a pitched roof over the door will improve, and some trellis with climbers. I think the most dull facade can be made pretty and characterful using plants. Get some flowering climbers going up the front, remove some bricks from your drive for flowerbeds as the op suggested... get some nice big pots with fragrant herbs and flowers on either side of the door! Then any of the new porches suggested would be perfect! Thanks all for the comments. The picture does not clearly show that the drive is about 3ft higher than the base of the front door, and there's a sloping path which runs right to left down to the door, approx 3ft wide. This means a porch is impossible although a canopy is a definite. Two super-cheap things: paint the lintle above the two tiny windows to make it blend in with the brick and encourage a creeper to cover the drainpipes on the right. 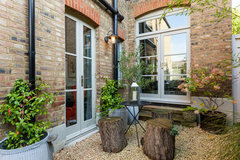 Given that the build is a pretty basic unexatravigant construction I would add a bit of generosity to the look by keeping any planters large and the plants in them well tended and plentiful. 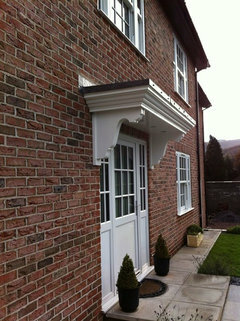 Keep the shape of the pots simple though, anything ornate with create a huge conflict with the simplicity of the build. Have you considered rendering it and painting it brilliant white? Although you have no soil for planting climbers into the ground either side of the door way-- you could plant into large pots and train climbers up the wall and over the porch. Its a cheap way of making it all softer and more colourful . 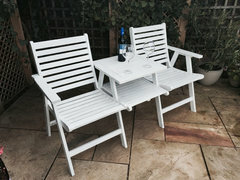 If you're working on a tight budget, how about some little things now so it looks cheery to come home to while you decide what to spend your money on? You could get some colour out there with some pots, or hanging baskets maybe, without breaking the bank. What about some climbers? I lived in a house very like this as a kid, and my mum always had pots and baskets and honeysuckle on a trellis by the door (painted bright coral...), so it was always a riot of colour and really cheerful. 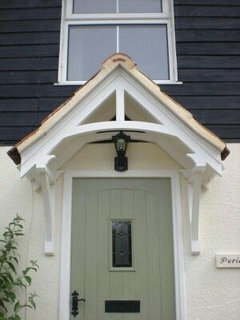 Then take your time choosing a door and a colour you love, or planning a porch. How can I brighten up this tiny loft room? 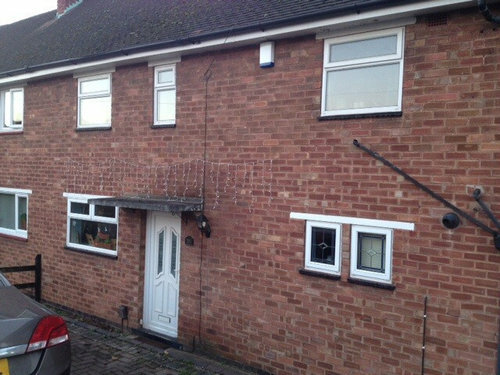 Ex-council house, drab exterior - how to modernise?